The Ngondro practice is very important for purifying negative karma and to generate wisdom. Actually, our main practice is Mahamudra, but you cannot practice Mahamudra without the purification or the blessing. In this context, the "Preliminary Practices" are most essential. This does not mean that we should look down on ourselves. Rather, we should accept our present situation - this is our karma now, and it is preventing the wisdom from appearing. This wisdom is already there. It is the nature of our mind. However, our disturbing emotions cover it. From our disturbing emotions we create karma. The result for us is more samsara where we create more karma. So the karma is very strong, and we have to weaken it by doing the "Preliminary Practices" until it cannot harm us any more. We practice the accumulation of merit through the Mandala-Offering, the third of the Ngondro practices. This will create in us all the necessary conditions to reach enlightenment. By doing the Ngondro practice you turn yourself into a "qualified practitioner". However, this does not mean that when you are finished then you are fully qualified. In addition to that, you need a good understanding of the Dharma. For instance you should know very well the teachings about the qualities of the Buddha nature. This subject is explained in the Uttaratantrashastra, Gju Lama in Tibetan. Other important texts that you should study are: The Distinction Between Consciousness and Wisdom (tib: Nam-she Yeshe) and "Showing the Essence of the Buddha Nature" (tib: Nyingpo Tenpa) [both texts were written by the third Karmapa Rangjung Dorje]. The Nyingpo Tenpa is a shorter version of the Gju Lama. It is also important to know the Madhyamaka teachings. Madhyamaka explains in what way samsara is an illusion, and that the Buddha mind is beyond this illusion. 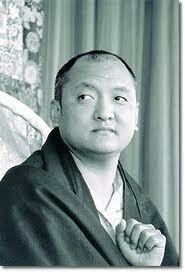 As a result, one understands that samsara, and one’s minds in its current mode are only delusions. The Buddha mind is something completely different altogether, something beyond this illusion. However, it is not different in the sense that it is separate from the present mind. Both are inseparably one. Madhyamaka explains exactly in what way the nature of your present mind is the Dharmakaya. But the Madhyamaka is not able to point out the Dharmakaya as something special like one could point at a flower and say, "This is a white rose." What the Madhyamaka can do is exactly show the nature of the illusions. Apart from that, there is something that you have to recognize and understand by yourself. It is the Mahamudra realization. For a meditator on this path, it is very important learn the philosophical views of the Madhyamaka. The Madhyamaka also explains that the conditions of "cause and effect" will continue as long as the mind is under the influence of illusions. Positive or negative causes always lead to their corresponding results. This is why meditators with the Madhyamaka view have great respect for the law of karma. Even Bodhisattvas on high levels will experience the results of unpurified actions in the postmeditative phase. Due to their great merit, generally they encounter good and positive results. But sometimes, during their postmeditative phase, disturbing things may appear to them. When a meditator is confronted with experiences during meditation, he needs a teacher who is very qualified in this practice. An example I always enjoy telling is the story about Gampopa who once had a problem with his meditation practice - all of a sudden Gampopa could not see anymore. He crawled to Milarepa and asked him what he should do. Milarepa answered, "Your meditation belt is too tight. You should loosen it." The "Bodhisattva Vow" helps to develop our positive side so we become helpful for other beings. It prevents us from falling into the lower realms as a result of anger or jealousy, etc. Even if such disturbing emotions arise, the Bodhisattva vow immediately purifies them. This is why we should never give up on developing Bodhichitta.